There’s a war going on that most of us can’t see, a behind-the-scenes battle in cyberspace between thieves who seek to steal vital information and those trained to stop them. The weapons: sophistication, knowledge and training. The bounty: untold quantities of computer-stored information that contains our most sensitive interests in both the private and public realms. This year, Grand Canyon University introduced new online and ground degrees to arm graduates with an arsenal of high-tech weapons so they can immediately join the front line against cybercriminals. 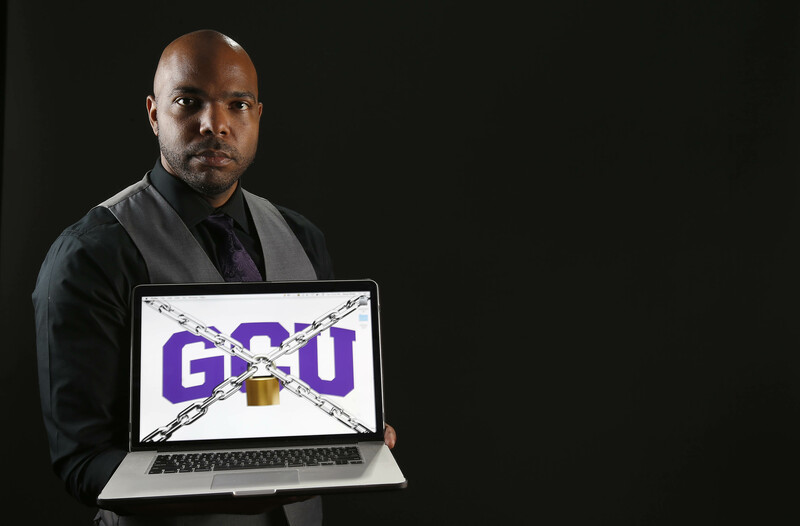 “At GCU, we are teaching our students the tools and the technologies that hackers use to penetrate our security,” said Dr. Roméo Farinacci, program director of Information Technology & Cyber Security for GCU’s College of Science, Engineering, and Technology. The degree is one of a rapidly multiplying list of new online and ground STEM degrees GCU is rolling out as it continues on its mission to produce well-trained, highly competitive graduates in the areas of science, technology, engineering and math. Dr. Mark Wooden, CSET dean, said GCU is developing 24 new degree programs in his college, including 12 in IT/computer science, seven in engineering and five in science. At the same time, the University is working on methods for allowing online students who work full-time to apply their experience in lieu of some required courses, Wooden said during a session on STEM Happenings at GCU. The Bachelor of Science in Information Technology with an Emphasis on Cybersecurity is GCU’s first step in offering a degree that provides unique, hands-on training and will help transform Arizona into a hot spot for cybersecurity professionals, Farinacci said. “Thirty years ago, we had security guards to protect us. Today, we need more than security guards because hackers are breaking in and stealing our identification, our information and our intellectual property, and they do it without walking a foot outside their homes,” he said. Arizona had the fifth-highest concentration of cybersecurity jobs. The average information security analyst annual salary in the Phoenix-Mesa-Scottsdale metropolitan region was $81,830. The average salary nationally was $88,890 compared with $79,390 for all computer occupations and $35,540 for all jobs. And the prospects continue to brighten. Between 2014 and 2024, cybersecurity employment is expected to rise 18 percent nationally compared with 12 percent in all computer occupations and 7 percent in all occupations. Additionally, Farinacci and Dr. Heather Monthie, CSET assistant dean, are working on a head-spinning number of fronts to enrich and complement the University’s emphasis on cybersecurity. For example, this year GCU partnered with the Arizona Cyber Threat Response Alliance (ACTRA), a nonprofit group that collaborates with the FBI, the Arizona Counter Terrorism Information Center and the U.S. Department of Homeland Security, to name a few. The partnership gives GCU’s cybersecurity students the advantage of practicing methodologies and strategies on ACTRA’s live cyberwarfare range, Farinacci said. And Farinacci is instructing in the ACTRA Cybersecurity Academy, a boot camp for handling real-world security events and threats. Other initiatives include developing a web-based cyber defense center, Cyber Lopes, that likely will go online this summer, and creating an e-learn cybersecurity boot camp. Cybersecurity students will branch out to study cyber operations planning and execution, cybercrime and cyber law and also utilize the live cyberwarfare range, among other options, Farinacci said. One new student is freshman Morgan Melton, who switched to the cybersecurity degree and said he knows other ground students who plan to enroll. That the program is new is an advantage because it is flexible and allows students to dig deep. “My skills will go outside the normal program that other students at other schools will have,” he said.